* ready to sail, glass-fibre foam epoxy hulls. Hulls are produced from epoxy glass-fibre sandwich laminate using RTM method (infusion). Its benefits are longer lifetime, better mechanical resistance and osmosis resistance. 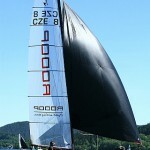 You can choose from glassfibre or full carbon hulls version. 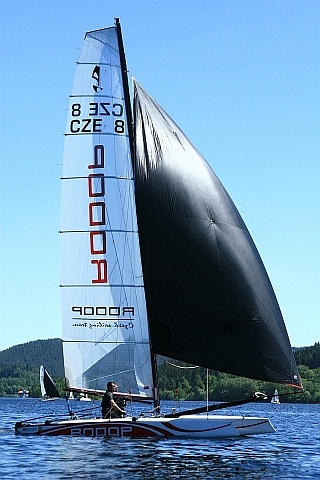 Mast, beams, boom, gennaker pole, tillers, tiller transversal tube, tiller extension, mast rotation tube – all this is produced from carbon fibre by means of unique CompoTech filament placement technology. It enables to put fibres in required place with optimal orientation so that maximal performance is achieved with minimum material volume.